The young Norwegian composer provides this stunning setting of the Latin text. Lush, dense chords and beautiful, soaring melodies are the hallmarks of this special composition. 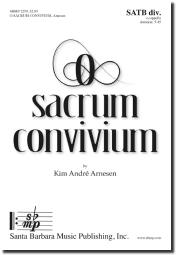 Commissioned by one of Denmark's premiere choirs, it is a welcome addition to the world of choral literature.